Star Wars: 5-Minute Star Wars Stories Just $7.63 Down From $13! You are here: Home / Great Deals / Amazon Deals / Star Wars: 5-Minute Star Wars Stories Just $7.63 Down From $13! Here’s a great Amazon deal on Star Wars: 5-Minute Star Wars Stories for just $7.63 down from $13! Get yours now while it lasts! Blast off into hyperspace with these eleven action-packed Star Wars tales! Jedi Master Yoda has a lightsaber showdown with the dreaded Count Dooku; Luke Skywalker and the Rebels race against time to destroy the Death Star; and the brave Rey makes a new friend when she meets the droid BB-8. 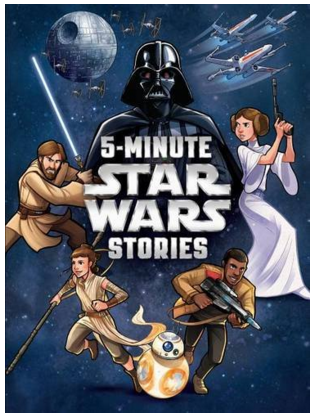 Each of these stories is the ideal length for reading aloud in five minutes–perfect for galactic adventures at lightspeed.